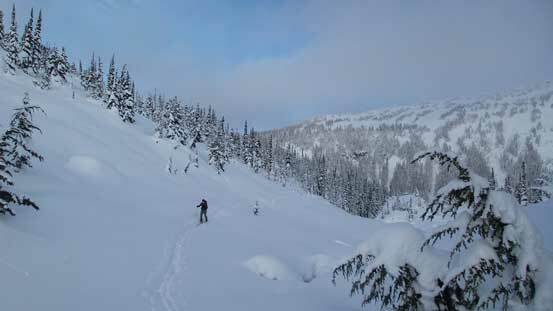 About a month or so ago Alex proposed the idea of spending 10 days around Christmas and New Year in the Lizzie Creek Cabin – a moderately remote area (by SW BC standard), and with about a dozen named summits all accessible from the cabin in one day, and some of which can be done in bad weather/conditions this seemed like the right way to do them. Ben was instantly game but I felt fairly skeptical initially probably due to my lack of experience in week-long trips (especially on skis), but I eventually made the decision to go anyway. 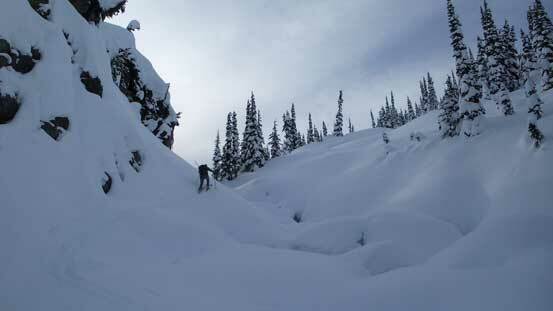 Alan Lerchs from Valemount joined us at the last minute and we all met in Pemberton in the morning of the 25th. 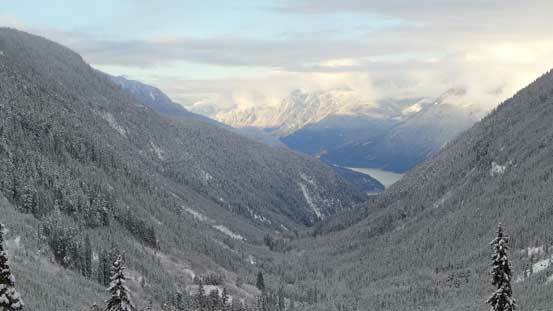 Despite the icy conditions we managed to cruise down the Lillooet Lake Road for about 15 km and then up another km or so along the Phacelia Creek Road (snow covered) in Alex’s Subaru, and parked right by the trail-head of the “bypass trail”. 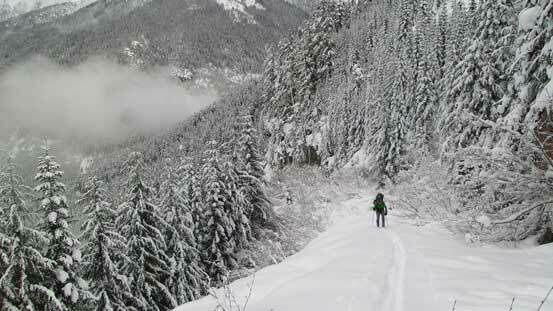 Due to an enormous wash-out at the beginning of the Lizzie Lake Road that changed the course of that river many years ago, the first kilometer was skirted around along a “bypass trail”. 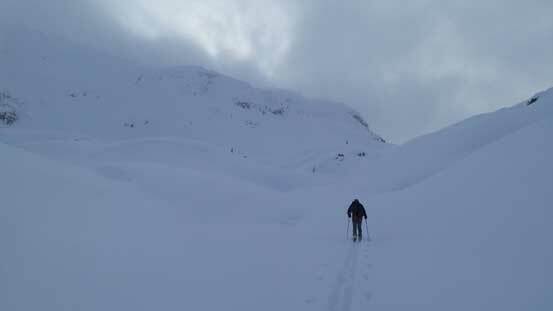 The trail was steep at places and with 10 days food, overnight gears, skis and ski boots all in/strapped on the pack it was not a pleasant exercise. But after some cursing we all made to the other side. Dropping the skis and ski boots was the first highlight of this day (thankfully this year was cold enough and there’s enough snow coverage allowing us to skin up right from the beginning). Right after finishing the bypass trail. The first few kilometers up along Lizzie Lake Road was fast going and I thought we’d make to Lizzie Lake in no time, but I was wrong. The alders soon closed in after about 6 km into the trip and it’s only getting worse. I’d heard some comments about the alders but never thought it’s that bad. Well, as someone coming from the Rockies the “alder swimming” up a logging road isn’t something I’ve done before so that might explain why. For the other guys this wasn’t nearly the worst they’d done. 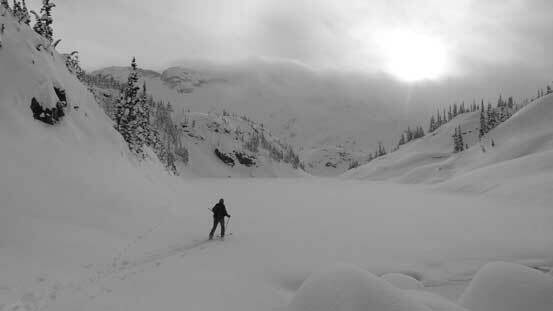 The crossing of the east fork of Lizzie Creek wasn’t a big deal, but still the skis had to come off briefly. I shuffled across a skinny log while the other guys boulder-hopped about 20 m upstream. Back to the road slog and we encountered more and more alders. At one point we almost make a mistake going up the Tao Lake Spur but thankfully the GPS saved us from going towards the wrong direction. There’s one section immediately after this Tao Lake Spur intersection being an absolute nightmare thrash but then it’s getting better (until the last 1.5 km before Lizzie Lake where another hellish thrash section was waiting for us). 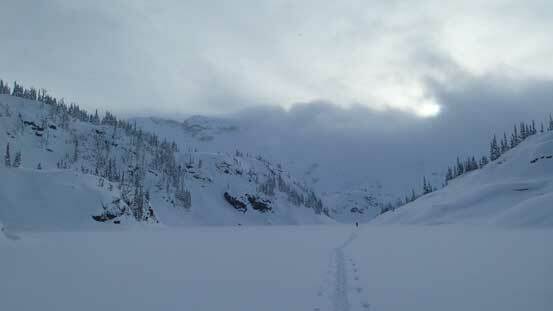 But with good attitude we all pushed through, although making to Lizzie Lake much latter than planned. 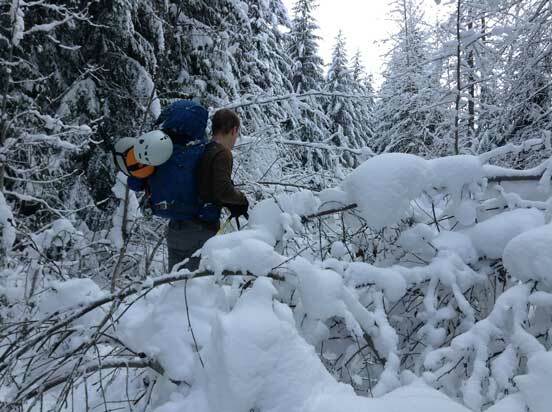 Ben whacking through the alders..
Now with only about half an hour of daylight time we knew there’s no way for us making to Lizzie Creek Cabin before dark, but Alex and Ben felt confident that with GPS navigation the final 300 m (vertical) slog could be done in the dark. 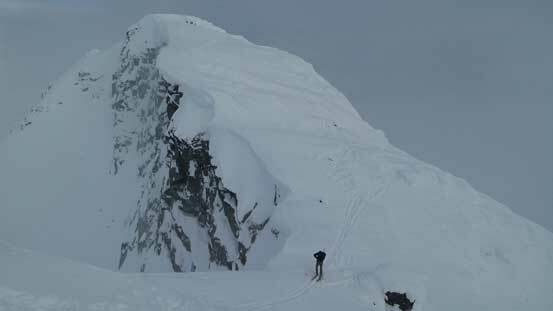 Two years ago they got lost following the vague description in John Baldwin’s ski book and had a forced bivouac along the same approach and there’s no way we’d do that again. This time we decided to take the summer trail which (hopefully) could provide a faster and less confusing way up. It was, and wasn’t… For most of the time we could clearly follow the bright orange diamonds up which saved us a lot of route-finding, but I have to say that trail wasn’t quite designed for ski travel with sections being very steep (almost pointing straight up). 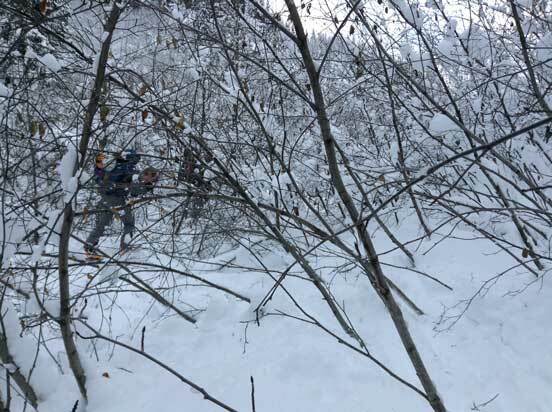 We had to take skis off and boot-pack (knee to waist deep post-holing) for a few times and some large deadfalls were all require some sort of detours. 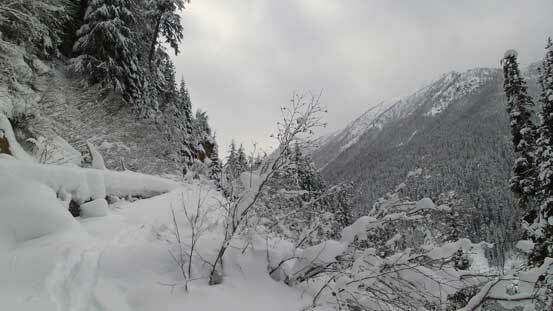 Thankfully there weren’t that many alders in the old growth forest (except for one avalanche path). A few more hours into the death march slog we came around a corner and dropped into the “Gate of the Shangri La”, and another 20 minutes or so up along the creek we arrived at the cabin, frustrated and exhausted. With the 10-hour approach done we knew the hardest day of this trip was over (and we could temporarily forget about the alders until a week later). We did some brief cleaning (no “giant rat” found as described by other parties) and sleep came easily for the night. The next morning we slept in till passing 8 am. 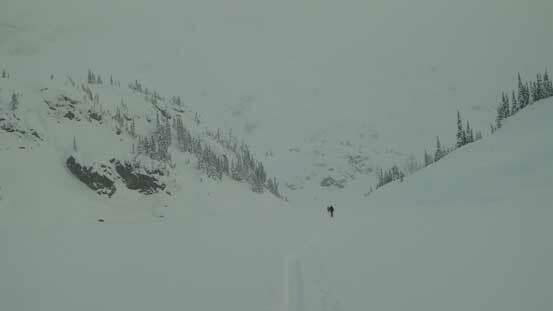 The objective was to knock off Long Peak before a (supposed) storm blowing in the day after changing the avalanche conditions. 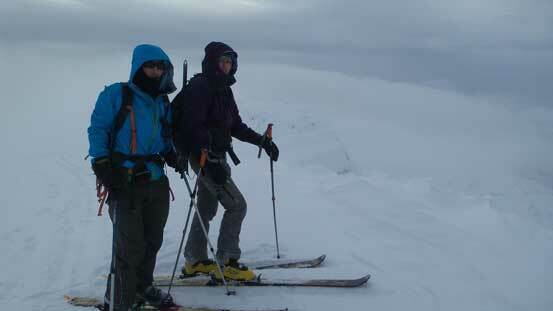 As for Saturday (Day 2) it was still Mod/Low/Low but for the rest of this trip the condition was impossible to tell. The weather was cloudy with all the nearby summits soaked in and Alan wanted to have a rest day break, so it was only Alex, Ben and myself heading out. We skin’d up the climber’s left side of the Long Lake’s outflow drainage – easy except for one steep traverse near the Lake. Skinning across Long Lake took a while (as expected given the name of this lake), and shortly after that the wind started to howl and the weather closed in. 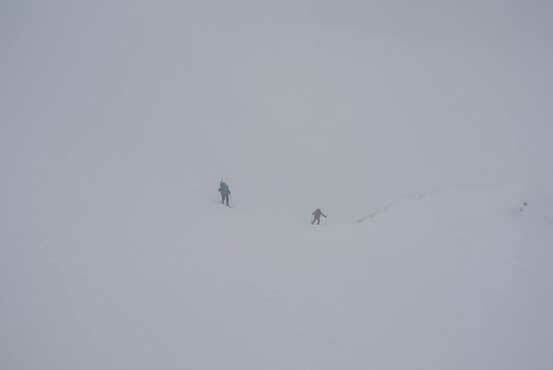 Up the first steep roll onto a ramp system we were in a complete white-out, navigating mostly by GPS and the immediate terrain in sight. Long Lake is fairly long, although narrow.. 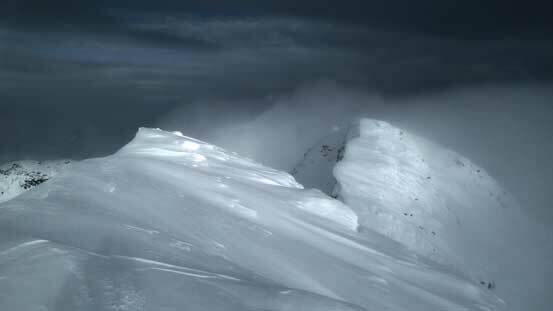 In this type of conditions we opted to the climber’s right option – aiming to crest the long SW Ridge as early as we could. 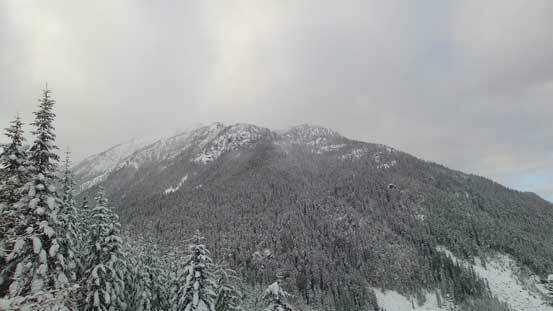 But even that all the terrain in our immediate vicinity was big. Alex led up a steep gully to the right (lots of switchbacks and steep kick-turns) and then we crossed a gentler ramp/plateau feature. 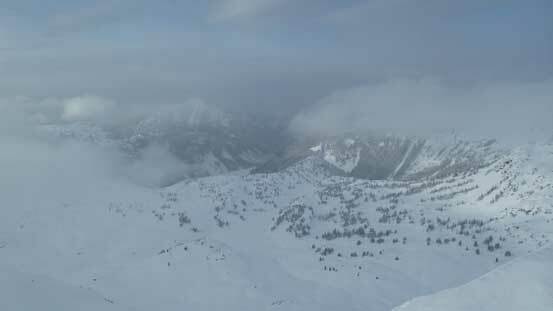 It was impossible to tell the exact as we were in a complete blizzard at this point, but we could tell that we did hit the SW Ridge soon. 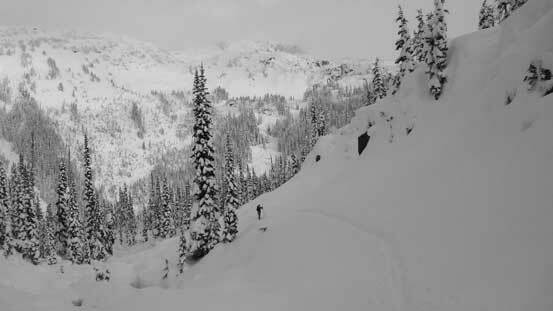 But then there’s one super steep roll immediately in front along the SW Ridge that we soon realized boot-packing was the only option. Skis strapped on the pack I led a line up the climber’s left side – convex, wind-loaded and steep (45 degrees or so at steepest) but it’s fairly short with not-so-bad run-out. The post-holing was terrible and I basically just swam my way up. About 2/3 of the way up a small surface slab released but I managed to anchor myself into the slope. We then traversed underneath the crown back to the right and managed to overcome this roll that way, only to realize there’s a second steep roll in front… Boot-packing again and this time we could stay more on the rocky terrain (slippery boulders!) 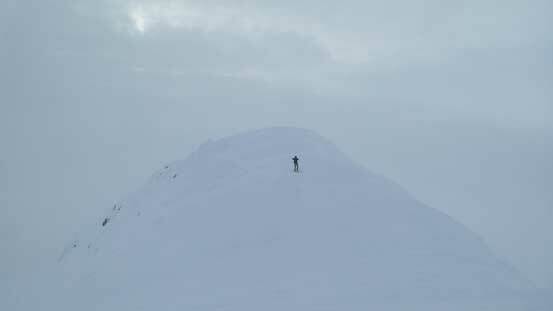 and shortly after we finally made to the first highpoint along this long ridge. 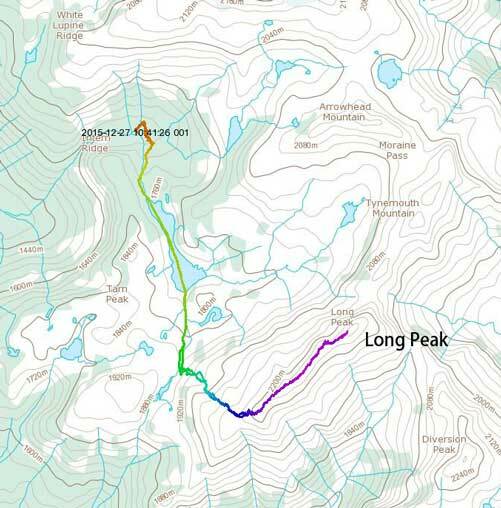 Long Peak is long… Our perseverance was rewarded by some temporary clearing in the weather. 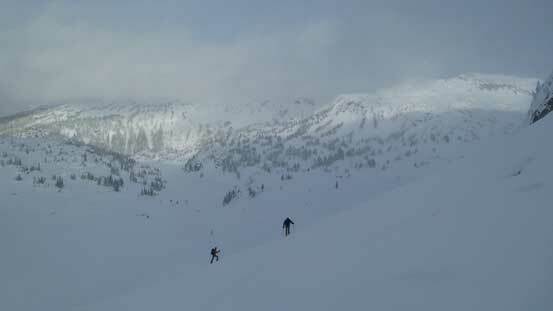 It seemed like we broke through the first layer of the clouds and the visibility had improved dramatically. 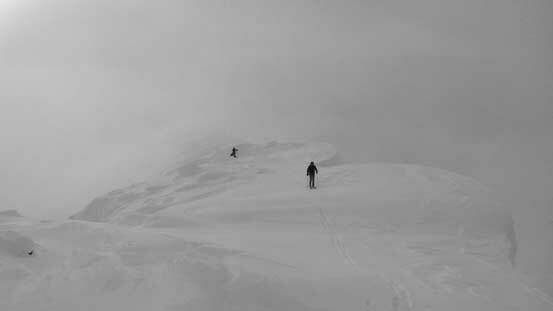 There were lots of big cornices and after overcoming another false summit the ridge soon narrowed down. 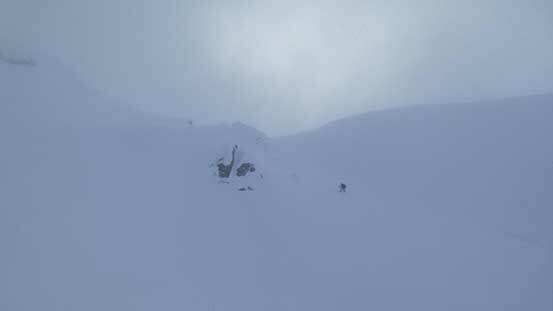 We were pleased with the improving visibility as the drop-off to the left (North) was massive had we messed up the cornices. 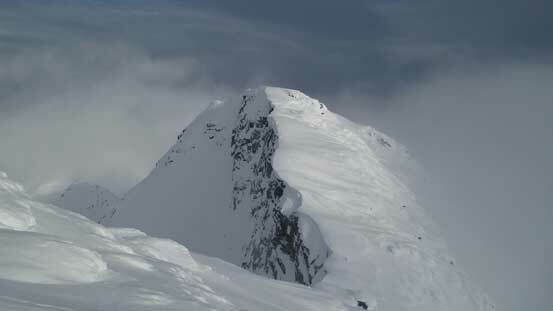 The true summit was finally in sight but then there appeared to have a steep drop into the connecting col. Thankfully it wasn’t that bad as we side-slipped our way down. The other side was also easier than appeared and then it’s the summit celebration time. Long Peak features a few steep descent lines down the north side but given the weather we’d have to go back the same way. We took our first break of this day at true/false col but even so slogging back up the false summit sucked a lot of energy of mine. 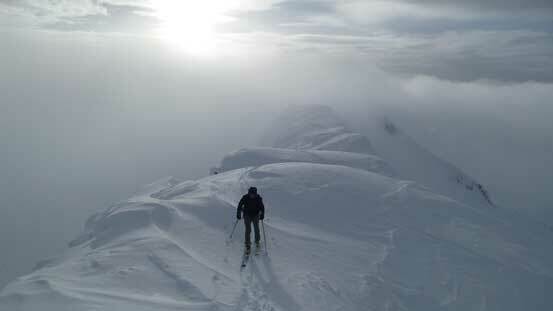 And then the visibility closed in again and in no time we were back into the white-out. 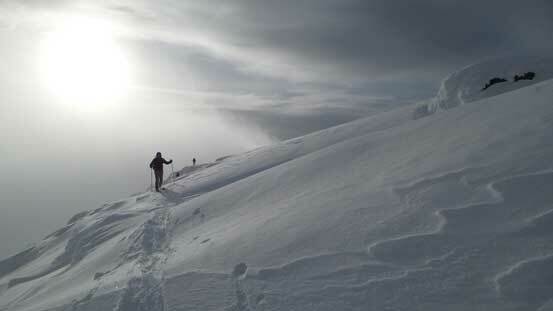 Thankfully we had our tracks to follow along that narrow and corniced ridge so it wasn’t a big deal. 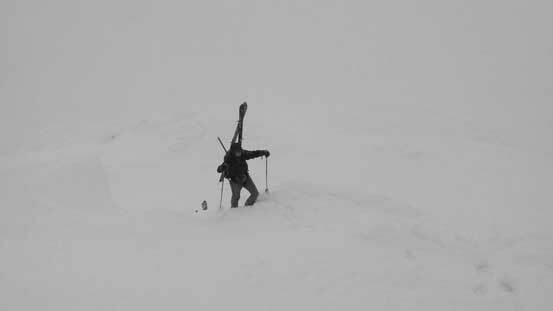 Back to the two boot-packing sections the visibility was down to zero and the wind was howling even stronger. Ben and Alex took their skins off and managed to ski down both rolls (they’re way better skiers than me). 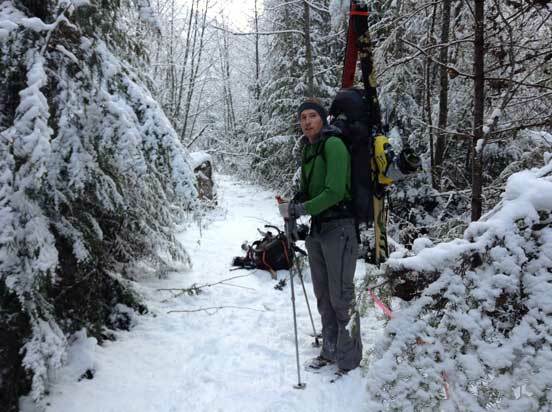 I just reversed what I did on the ascent (down-climbing with skis strapped on my pack). Even so there’s some guess work as where exactly to drop into the lower roll, but all went well. And then it’s time for some skiing. There was lots of wind-loading on the two steep rolls that we skin’d up earlier, but all held (reasonably) well on our descent. 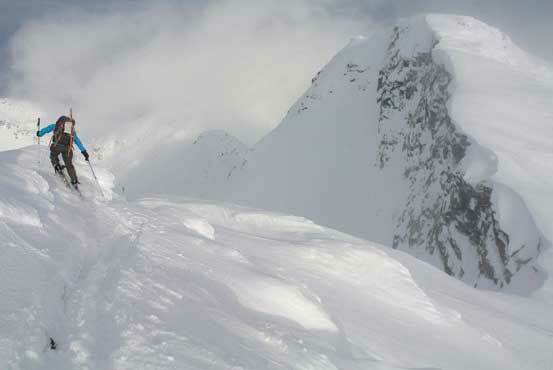 There did have one crack for the gully and then I triggered another small slab skiing down the lower roll. The rest of the return was uneventful and it’s overall a longer and much more involved day than I was expecting. But it’s good to get one of the major objectives in this trip done by only Day 2. The weather for the next day was supposed to be even worse so we figured it’s time to sleep in till whenever we wanted and decide from there.